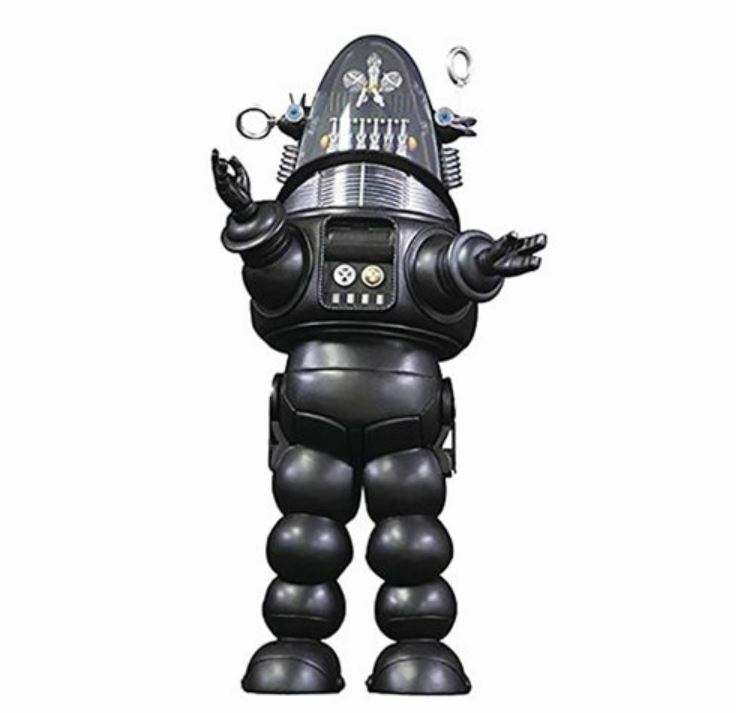 Inspired by the new blue space suits in the new movie Prometheus, yesterday we began showing the evolution of the space suit as seen by Hollywood from the 1950s through the 1970s, including a few photos of real astronaut suits that influenced movie designers. 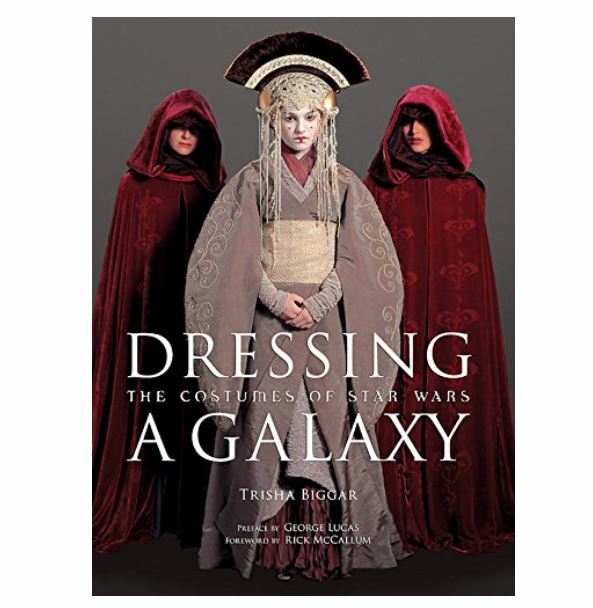 Today we continue trekking forward to the costumes of today. 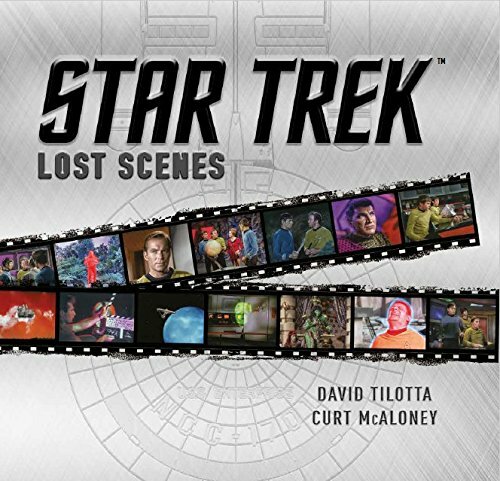 In 1979 the original cast of Star Trek returned in Star Trek: The Motion Picture. 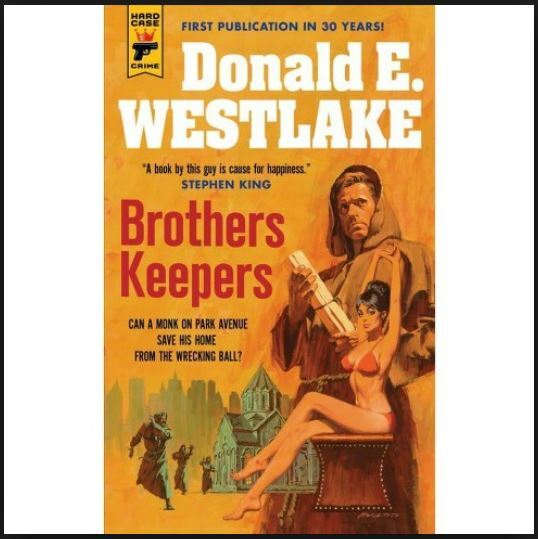 Mr. Spock, clad in an orange space suit, tries to meld with the menace called V’ger. 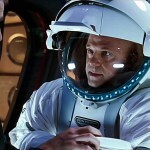 Kirk arrives in a white suit to rescue Spock after he is knocked unconscious. 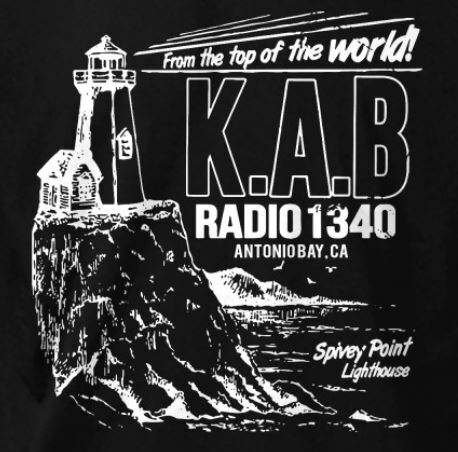 Forget about the Astronaut Farmer, I really liked the 1979 TV series Salvage 1 with Andy Griffith, an early glimpse at an astronaut a la Virgin’s Richard Branson, where private folks build a rocket from scratch and send it up, up, and away. I don’t recall Roger Moore wearing the classic aluminum looking suit in the James Bond movie Moonraker, but he wore one in PR photos. 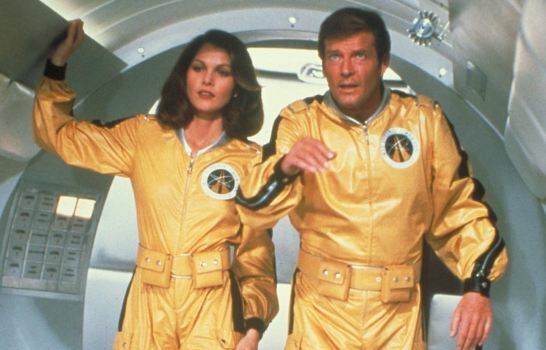 The yellow suits worn throughout most of Moonraker’s space scenes. 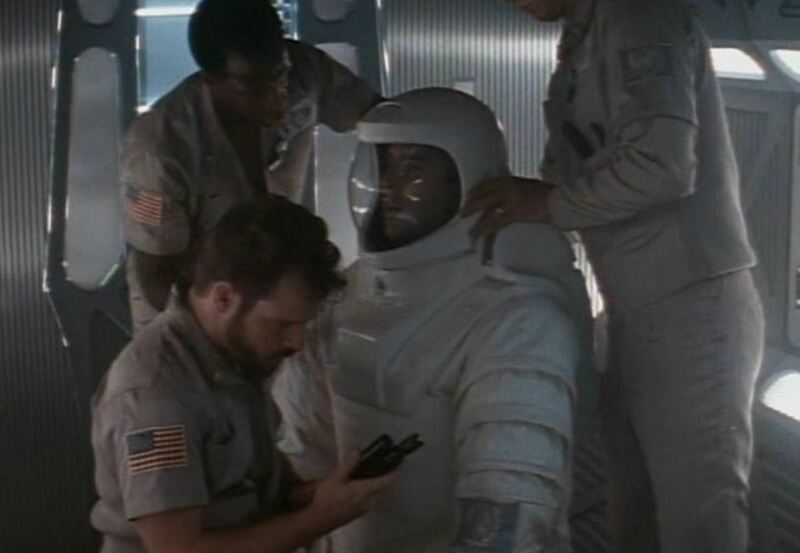 Here is an astronaut scene you might not recall–In 1980’s Superman II, Zod and friends use American astronauts on the moon as playthings before bringing their wrath to Earth. 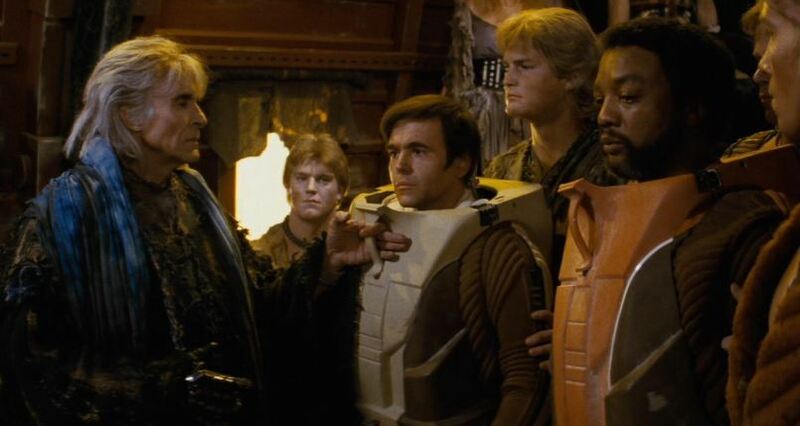 In 1982 we get another look at the Kirk and Spock suits from Star Trek: The Motion Picture, now worn by Walter Koenig and Paul Winfield alongside Ricardo Montalban in Star Trek II: The Wrath of Khan. 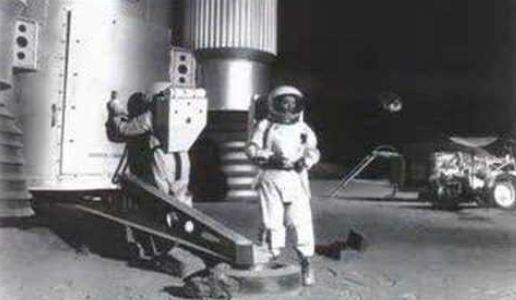 More of a protective suit, a few of these radiological suits were equipped with glass helmets, making us think they might work outside the USS Enterprise. 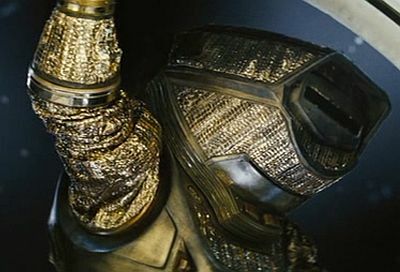 Here Scotty and his engineering crew wore these in both Star Trek: The Motion Picture and Star Trek II: The Wrath of Khan. 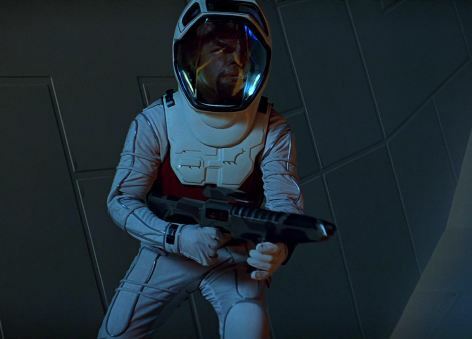 Either way I think these make for some awesome designed space suits, and Scotty never looked cooler. 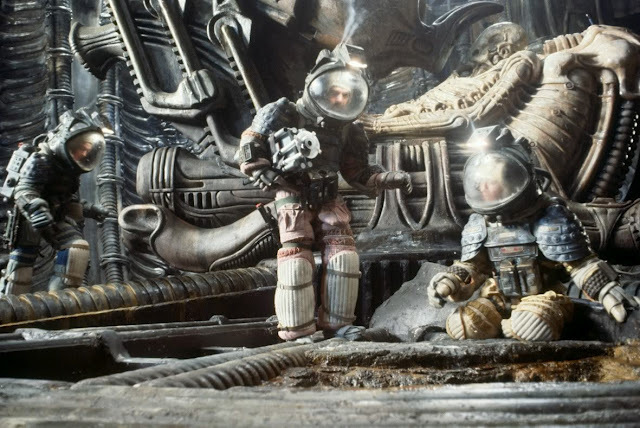 In 1979 we met the first of Ridley Scott’s Alien universe, and witnessed HR Giger’s visionary suits for the crew of the Nostromo. 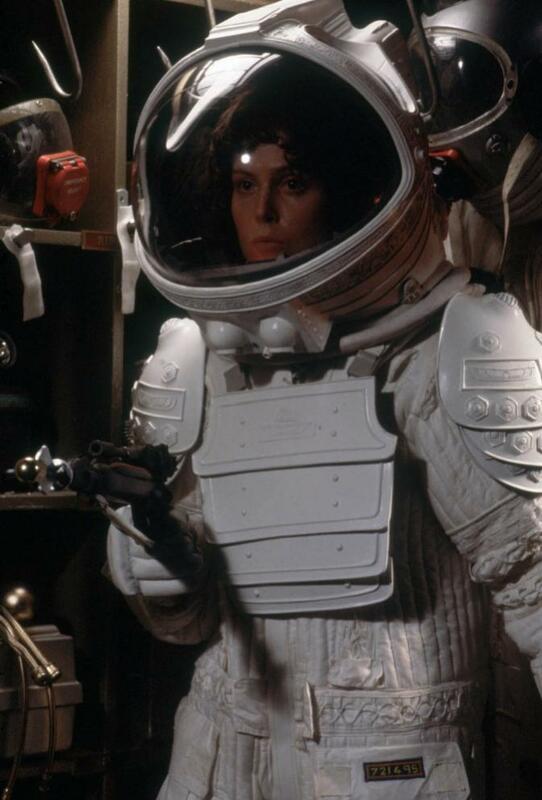 Sigourney Weaver’s character Ripley had her own version of a space suit. 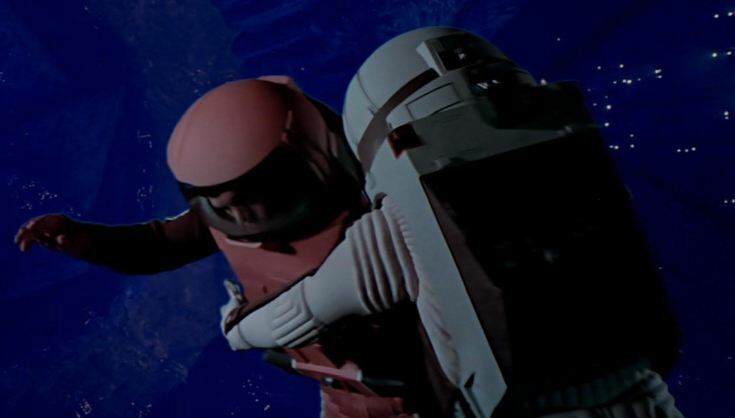 In the 1981 film Outland, Sean Connery takes an excursion to Jupiter’s moon Io. And again we have multi-colored space suits! 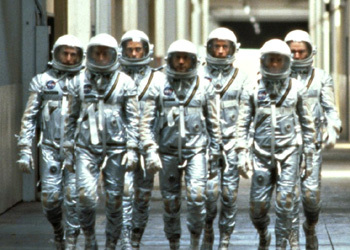 Sometimes creating space suits means replicating reality, and it was hardly ever done better than in 1983’s Mercury program biopic, The Right Stuff. 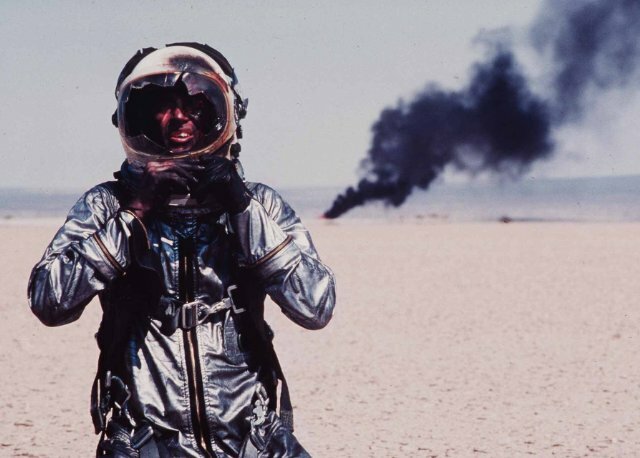 The Right Stuff also featured Sam Shepard as Chuck Yeager, and here he augured a test plane into the ground. Crash and burn. 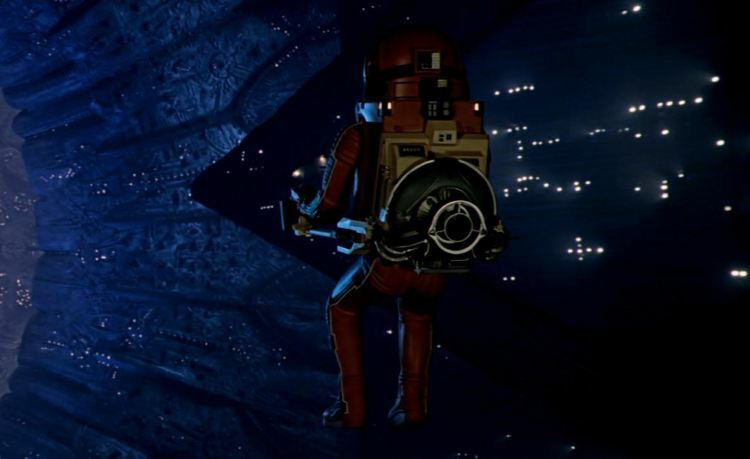 In 1984 Roy Scheider discovered this time he needed a bigger ship in the 2001: A Space Odyssey sequel, 2010. 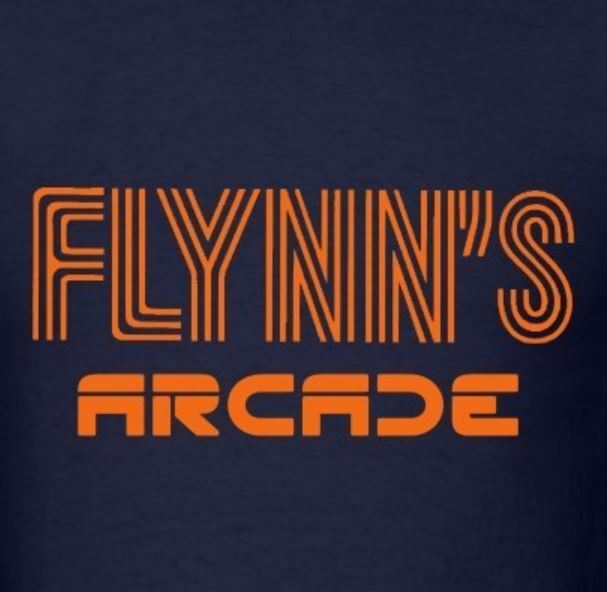 One of my all-time favorite sci-fi movies is The Last Starfighter. 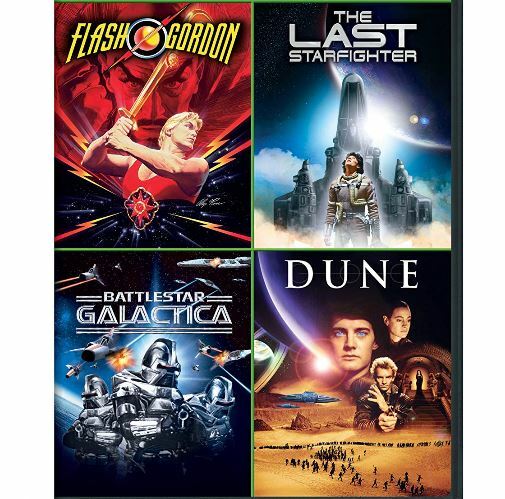 Grig and Alex wore some of the best looking space suits in this film (OK, yes, I’ve included a few pilot outfits in this list). 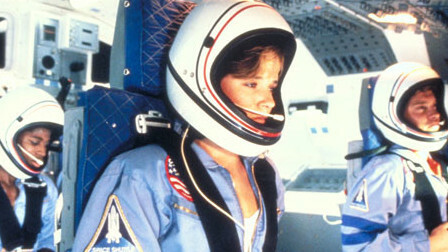 In 1986 we got to see kids in space in Spacecamp, starring Lea Thompson. Marketed as “from the makers of Star Wars,” the 1990 film Solar Crisis didn’t even come close. 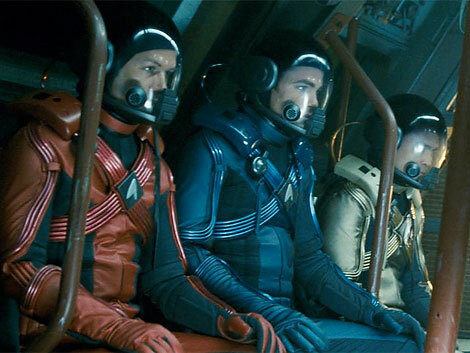 In the original (but unreleased) cut of Star Trek Generations, the film was to open with a suborbital drop by Captain James T. Kirk. The heat shield tiles were a good idea. 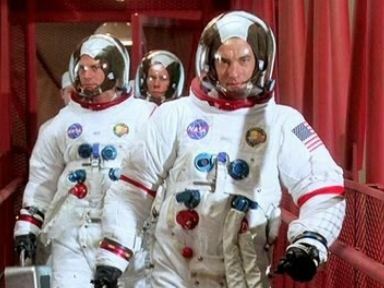 Ron Howard created one of the best films ever of any genre with the superb account of Apollo 13, starring Tom Hanks and Kevin Bacon. 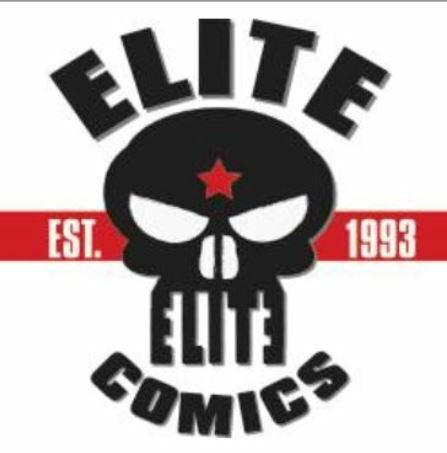 In 1996 with Star Trek: First Contact, Captain Picard and Worf wore this type of suit to defeat a threat from The Borg. 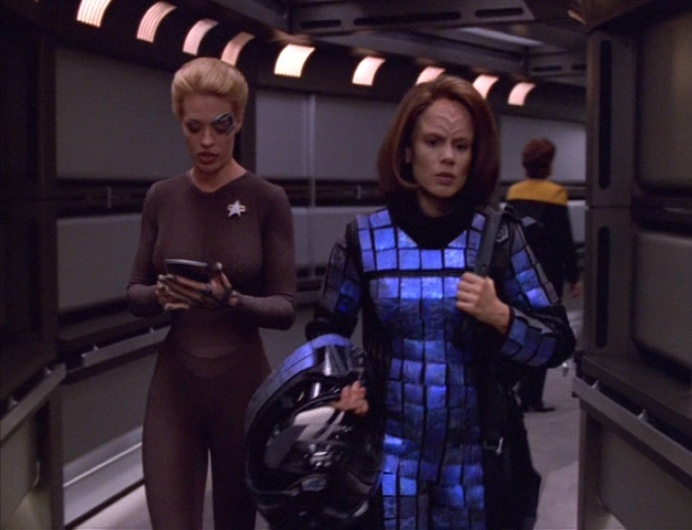 These suits were later re-used by the crew in Star Trek Voyager. In 1997’s Event Horizon, Sam Neill wore a darker and grittier look. 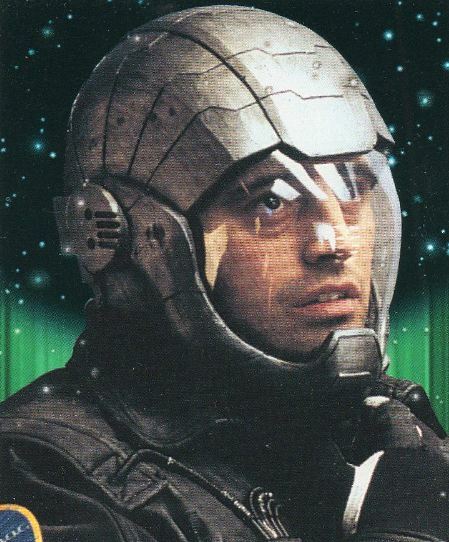 Matt LeBlanc piloted the Jupiter 2 in the remake of Lost in Space (1998) complete with helmeted suit. 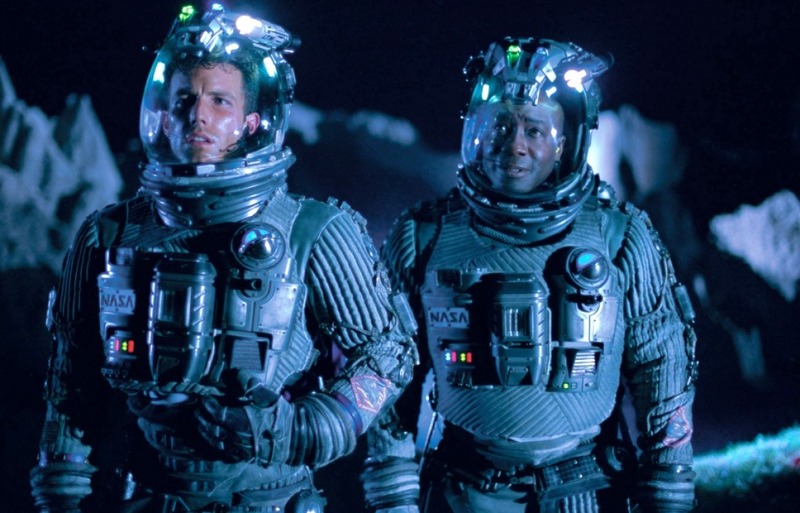 In the blockbuster 1998 movie Armageddon, Bruce Willis and Ben Affleck wore these realistic space suits to save the world from a giant rock. 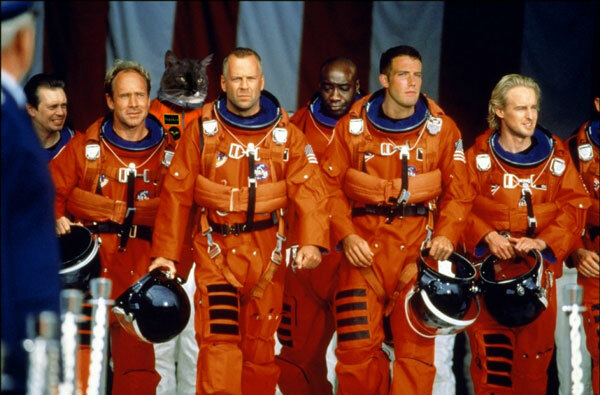 …but first the crew had to wear these suits to drill through the jagged asteroid’s surface. 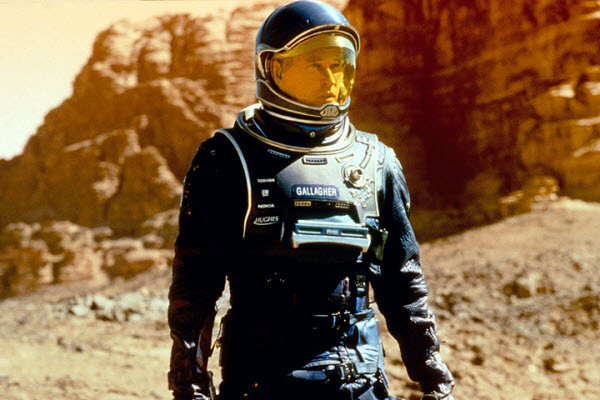 In 2000 Val Kilmer starred in Red Planet, blending horror and sci-fi, wearing this nicely designed space garb. 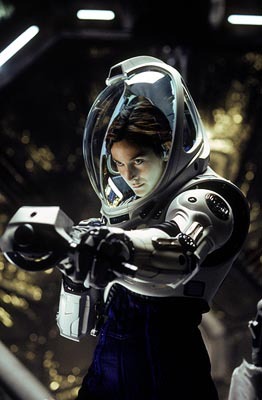 Red Planet also featured The Matrix’s Carrie Ann Moss, sporting her own cool but differently styled suit. 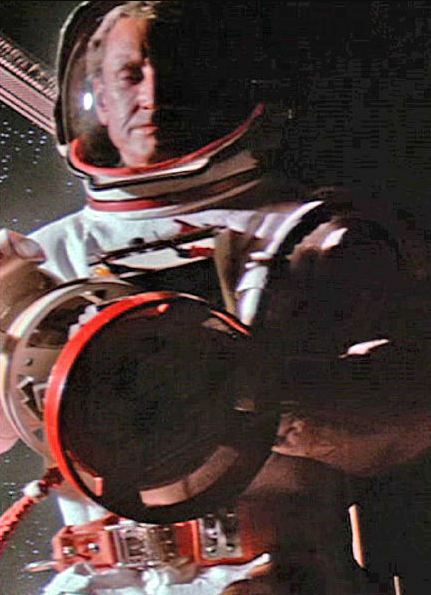 In 2000 the all-star cast of Space Cowboys mirrored reality, looking like John Glenn in his second voyage to the stars. 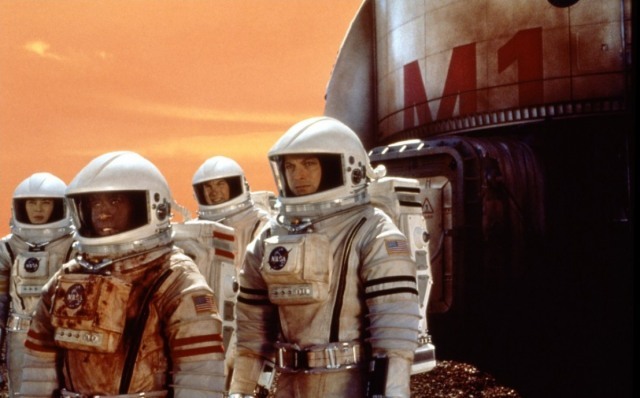 Also in 2000, Mission to Mars featured this type of astro-wear. 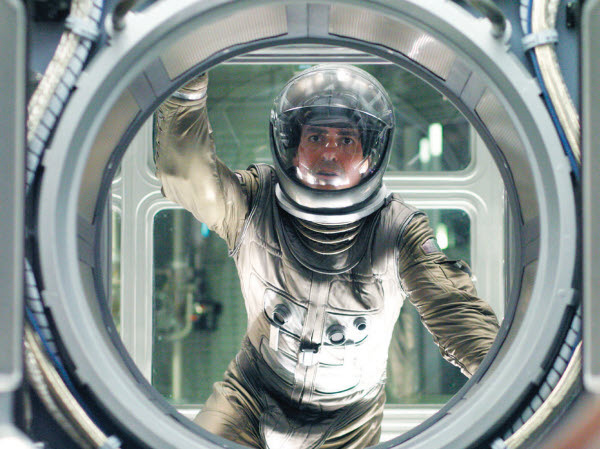 In 2002 George Clooney donned a space suit in Solaris, where a psychiatrist investigates a space crew. 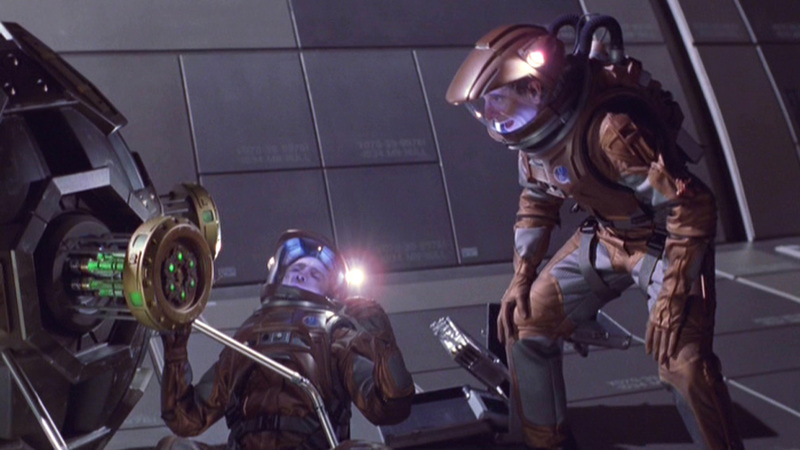 But it is really hard to beat these copper colored space suits as worn in 2002 by Scott Bakula’s Captain Archer on the TV series Enterprise–for me the color reflects the old heavy underwater gear of centuries past. 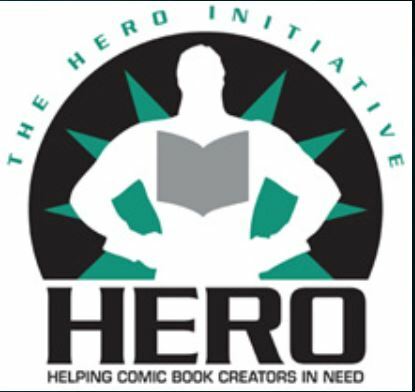 The key impetus that created the Fantastic Four in the 2005 film was a volley of cosmic rays, turning Michael Chiklis’s Ben Grimm into The Thing. 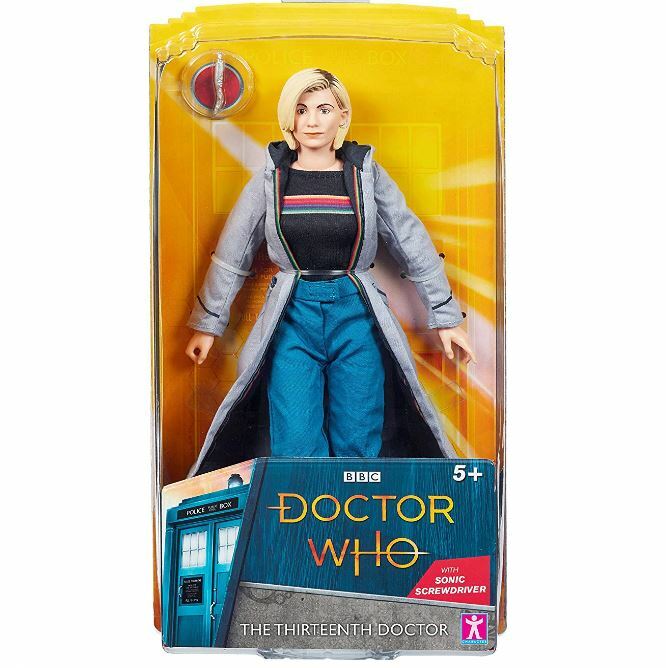 In 2006 in the episode “Waters of Mars” David Tennant’s Doctor Who lead an incredible mission to save Earthlings in space, a mission with a terrible destiny. 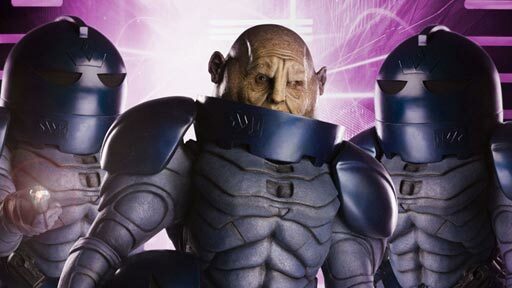 And in the same year, the short aliens with big blue suits, the Sontarans, also from Doctor Who. 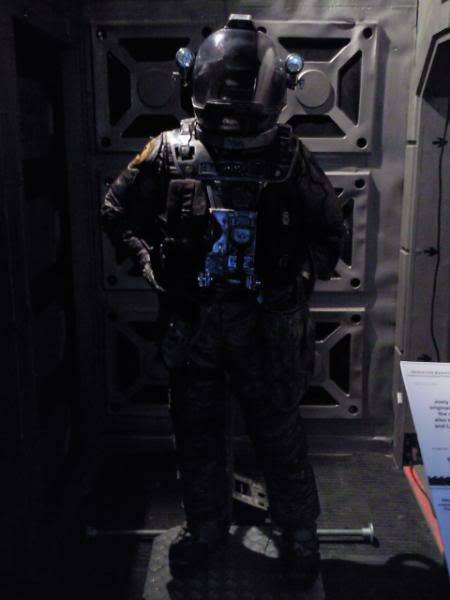 Maybe the strangest space suit so far, this bulky outfit was worn by Cillian Murphy in Danny Boyle’s film Sunshine. 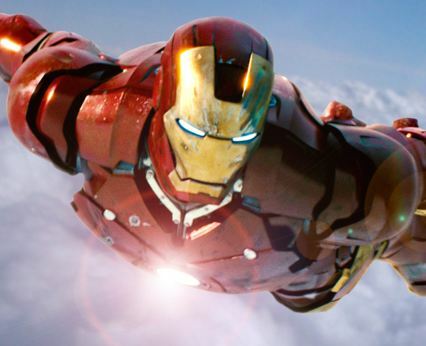 Maybe the future is really in gear like Iron Man’s suit. 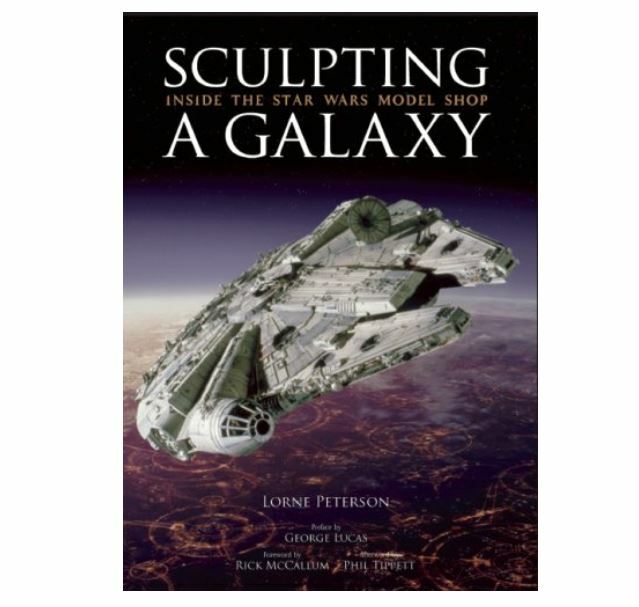 After all he’s taken it into space. 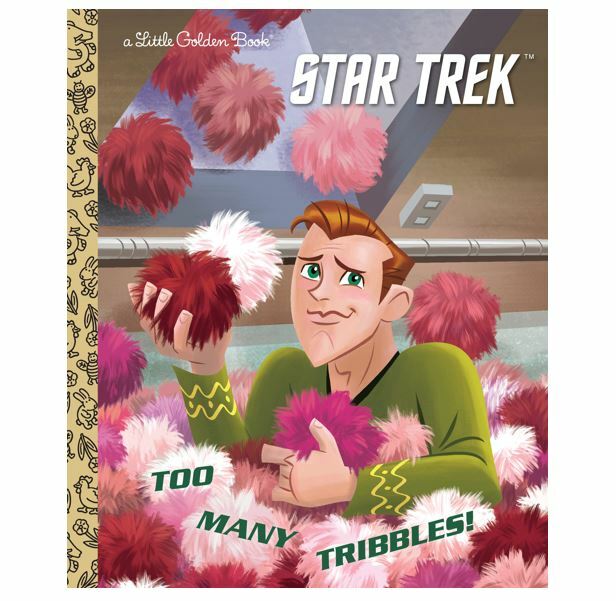 Whether you’re a traditional Trekkie or not, you had to like the great look of JJ Abrams’ 2009 remake of Star Trek. And still we have mutli-colored outfits to tell everyone apart! 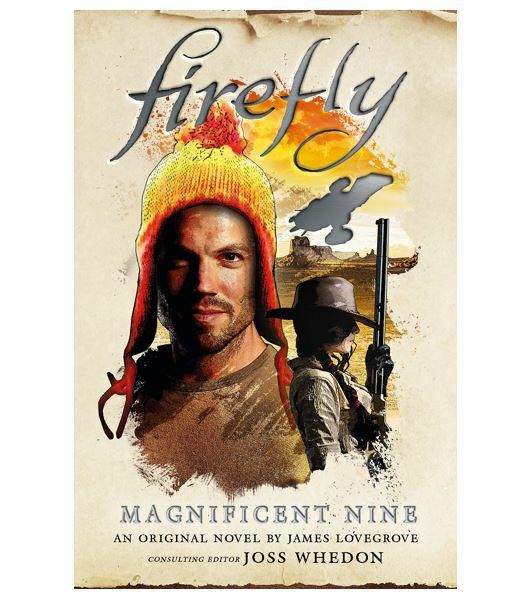 In 2009’s Moon, Sam Rockwell has some issues to deal with. 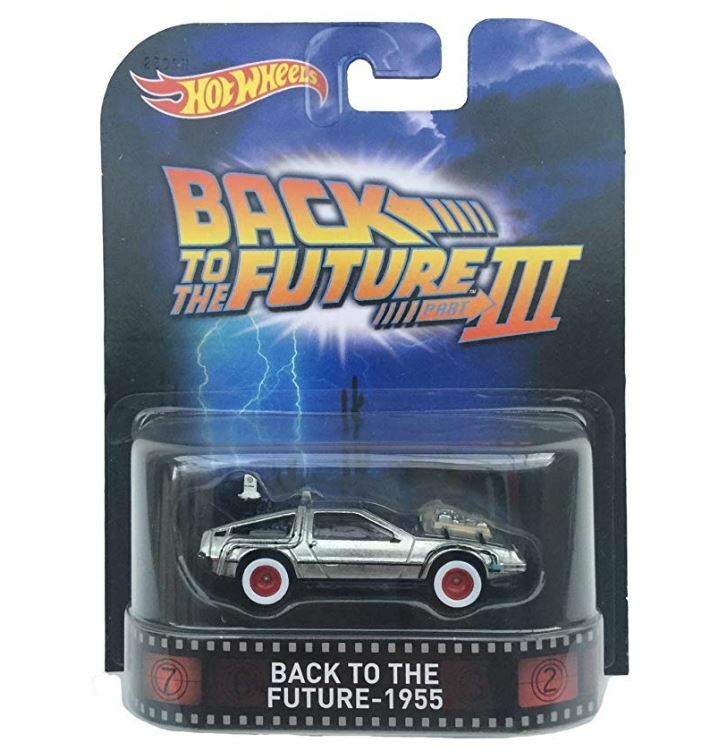 One of those over-hyped films that I couldn’t get through. 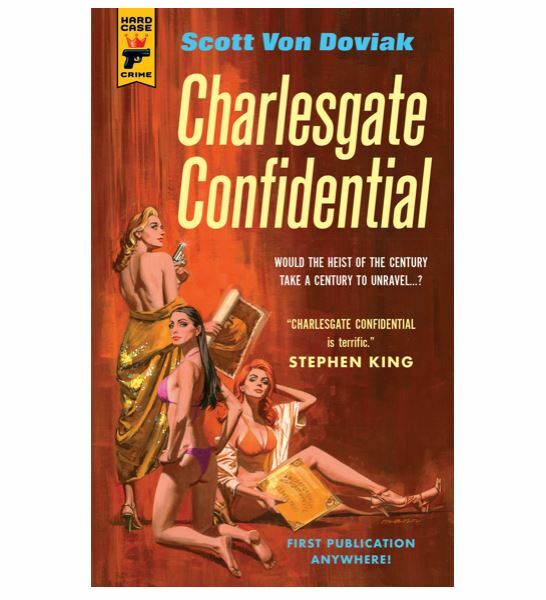 Still, it had a good overall look. 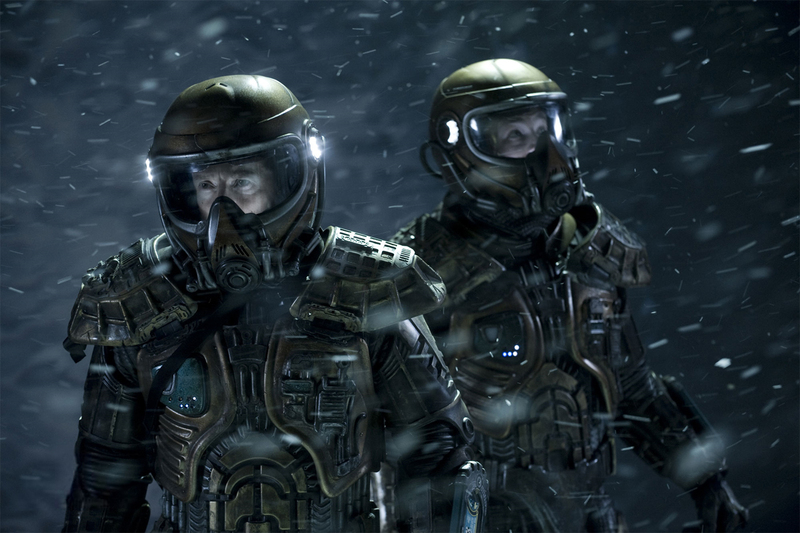 In 2009 the TV series Stargate Universe featured these very futuristic, detailed space suits. 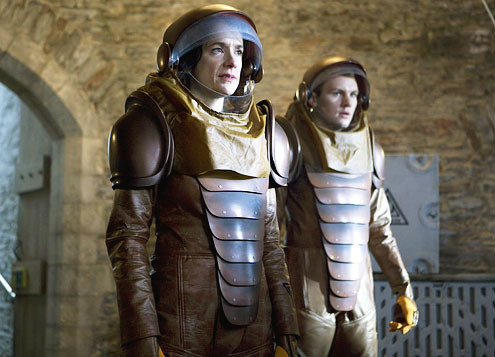 Very simple space suits from the 2009 TV series Defying Gravity. 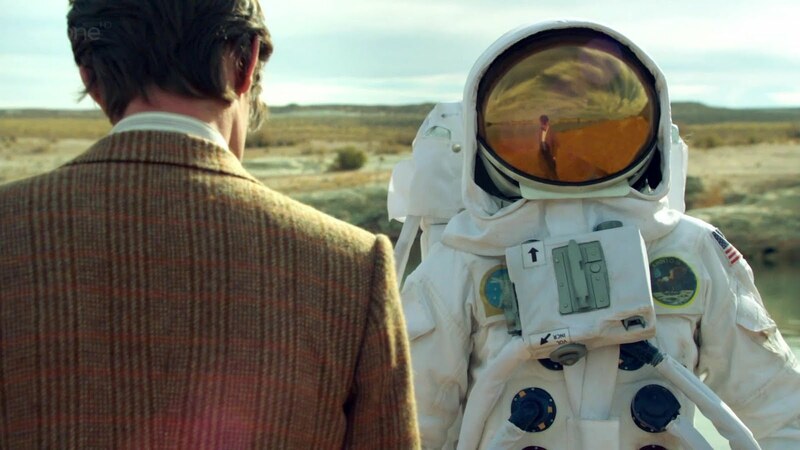 In 2011’s Doctor Who episode “The Impossible Astronaut” Matt Smith was killed by whoever was in this astronaut suit. 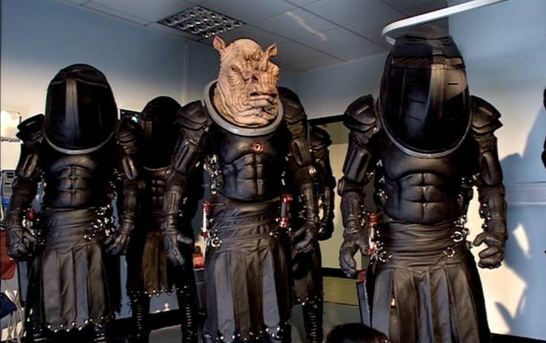 Also in the 2011 Doctor Who season, the episode “Rebel Flesh” featured this future-human protective gear, which might as well be a space suit. 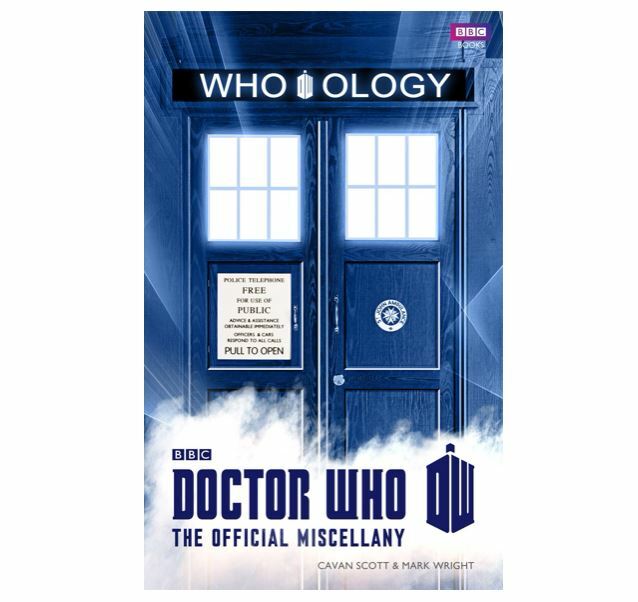 Over the decades Doctor Who has featured aliens in space suits, too, and too many to list! 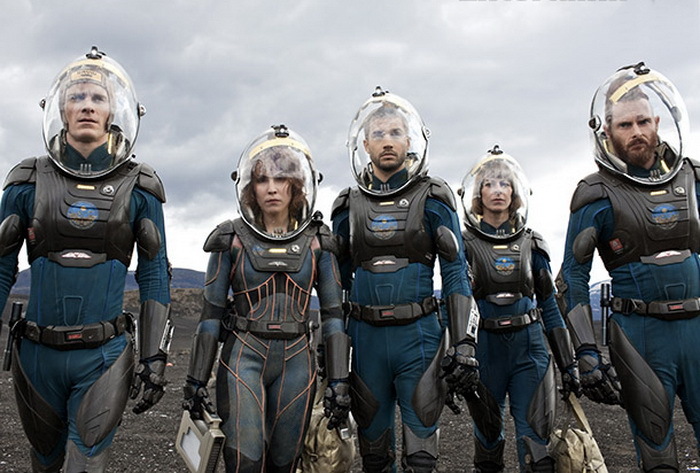 Which brings us to June 2012, and next week’s premiere of Ridley Scott’s Prometheus, with these slick blue suits appearing on posters everywhere. 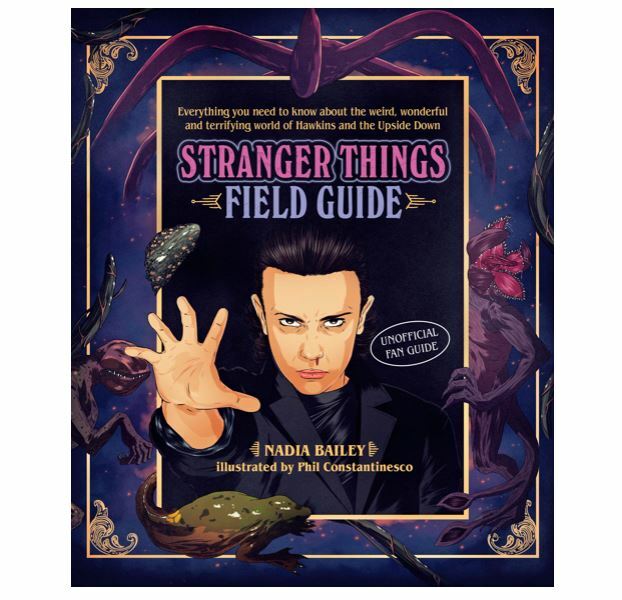 Now we know this was not a comprehensive list, but please drop us a note and let us know if we missed any key space suits.